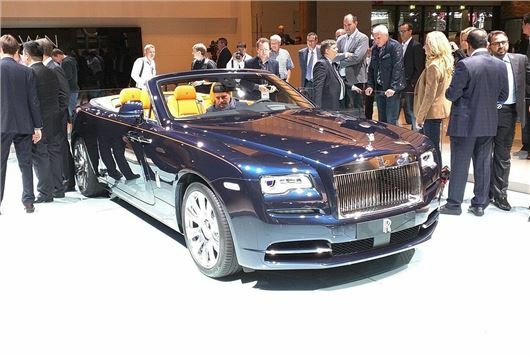 Rolls-Royce is calling the Dawn – a convertible variant of the Wraith – 'the sexiest Rolls-Royce ever built.' The new model will cost around £250,000 and will be available from early 2016, following its public debut at the Frankfurt Motor Show 2015. The fabric roof fitted to the Dawn takes 22 seconds to fold down and works in complete silence, plus it can be operated at speeds up to 30mph. Rolls-Royce says that, despite this being a soft-top, there is no compromise in comfort regardless of which seat you choose, front or back and access to the rear is good due to the long doors. Power comes from a 6.6-litre V12 petrol engine with peak power of 570PS and 780Nm of torque. The substantial power output means the Dawn can get from 0-62mph in 4.9 seconds despite weighing 2560kg. Emissions are 330g/km and fuel economy is 19.9mpg. The Dawn has a well-appointed cabin, as you would expect, with plenty of luxurious material choices for buyers to select from. There is plenty of technology too, including an eight-speed transmission that responds to the road ahead using GPS data. This means it can preselect a lower gear for inclines or bends, or a higher gear for a straight flat road. Equipment includes satellite navigation, an infotainment screen operated by a rotary controller, automatic emergency braking and automatic cruise control. There is also a Bespoke Audio system which Rolls-Royce says is the “most exhaustively designed automotive hi-fi system ever”. Phew.